There’s a really nice shot in the middle of this Divorce episode where the ex-spouses and their dates stand as basically mirror images of each other. Like-minded hair, outfits, even height differentials. The similarities are so telling. When we enter a new relationship, if we’re the same person, why do we think things are going to wind up differently this time, even with new other people? Robert is a bit shaken by this realization after Nick points that he definitely has a “type”: small, strong blondes. 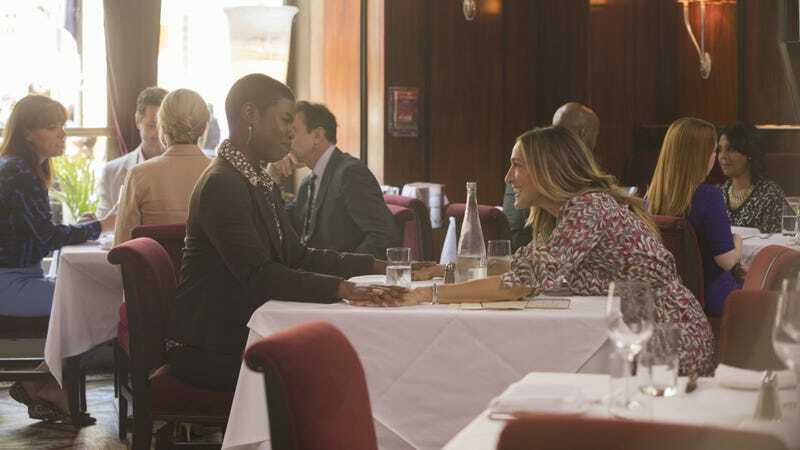 Jackie and Frances are both confident small business owners, but the thought that he may be diving deeper into a situation similar to his marriage, spurred on by Jackie wanting to enter into a legal business partnership with him, is enough to make Robert momentarily skittish about his relationship. Frances is in a similar parallel: She starts the episode by lying to Andrew about the real reason her marriage failed (her infidelity). This ends up coming back to bite her when she reveals the truth to Andrew later, after the gallery opening. He immediately reverts to the churlish, bitter, wronged husband he was, lashing out at Frances with some anger clearly left over for his ex. But Frances was ready to break it off with Andrew anyway after feeling guilty about getting asked out by Skip: another unwelcome reminder from her own marriage. Actually, Andrew is only the first of the two central relationships Frances ends in “Going, Going… Gone.” Turns out that Skip has scooped up Sylvia from right under Frances’ nose, and now it’s Frances who feels betrayed. She does, and rightfully lashes out herself. I don’t blame her, especially with all the cajoling she had to do to get Sylvia to do a show in the first place, but I also don’t blame Sylvia for taking advantage of this opportunity. But now it’s Frances’ turn to be left, and it’s probably even more painful than a romantic breakup, as Sylvia’s success was supposed to help launch her own career as well. It’s said that insanity is doing the same thing over and over again and expecting a different result. It’s why getting into relationships so quickly post-divorce, like Robert and Frances did, is usually a bad idea. And maybe why those relationships are turning out to resemble the one they had before. Maybe that’s why the two turned to text each other in the middle of the night: Robert to congratulate Frances, who can’t even respond because it’ll mean having to thank Jackie as well. The ongoing theme of this season appears to be how much Frances and Robert are still tangled up with each other—whether they realize it or not, as Nick points out—even after Divorce. Just a petty note that I started thinking about at length this episode: Where does everyone’s money come from? Robert and Jackie are selling houses together, but doesn’t he have to be a licensed realtor to do that? How is Frances able to keep that house with whatever sparse income she must be making at the gallery? And does she have to share that with Robert (just remembering her big reason for not taking that awesome job last season). Since Robert was working construction at the beginning of the season and last season a lot was made of how in debt they were, just wondering what happened to all the money. Maybe Jackie buying Robert’s house helped pay it off? Not that interested in Dallas’ almost-divorced younger guy, but again, she looked amazing at the opening. Nick hilariously announces in his toast that Diane is reluctant to call attention to herself. Kind of surprised that the kids wouldn’t want to come to their mom’s first big gallery opening, but knowing those kids, maybe not. Next week: Second season finale. Any speculations on if we can expect a Divorce season three? I really don’t hear a lot of chatter about this show. Other than here, of course.